In Elysium, the world is starkly stratified between the rich and powerful who live on the titular space station and everyone else who live a squalid, oppressed existence on Earth. Max, crippled in an accident at work and given days to live, dons a super-powered exoskeleton to break into Elysium, heal himself with rich people’s space magic, and start a revolution that will even the playing field for humanity. 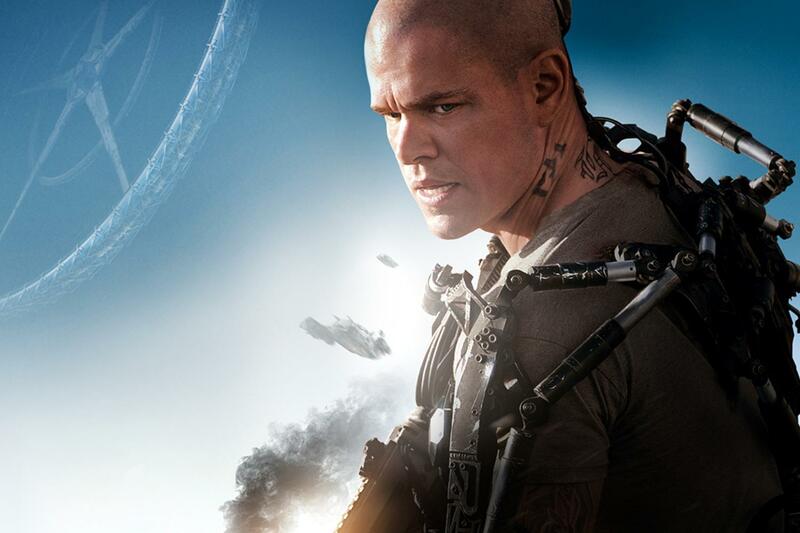 Elysium seems designed to be a film with a message, but by relying on simplistic caricatures and an undeveloped setting it’s not clear what that message is supposed to be. I hesitate to call the cast of Elysium “characters”, because to do so would be to imply that they in some way resemble real people. The cast members with the most personality are the brutal and unsympathetic droids. The human cast is merely a selection of caricatures. Matt Damon plays Max, a former car thief turned factory line worker who fulfils his apparent destiny to start a revolution in Elysium. I think we are supposed to like Max, but he never says or does anything likeable. I think we are supposed to believe in his destiny, but we are never given a reason to. Max is a tool in the service of the plot, just there to get the job done. Everyone else on planet Earth, squashed under Elysium’s jackboot, is a caricature of poor people. They live hard lives of subsistence, often in poverty. But they laugh, they love, they protect each other and they party. Clearly their poverty makes them rich in spirit. In contrast, everyone from Elysium is a caricature of rich people. These people show no emotion, care little for their fellow humans, and are ruthlessly calculating. We watch them attend cocktail parties, swim in enormous pools, and run powerful organisations, but they don’t appear to enjoy a second of it. Clearly their material wealth makes them poor in spirit. 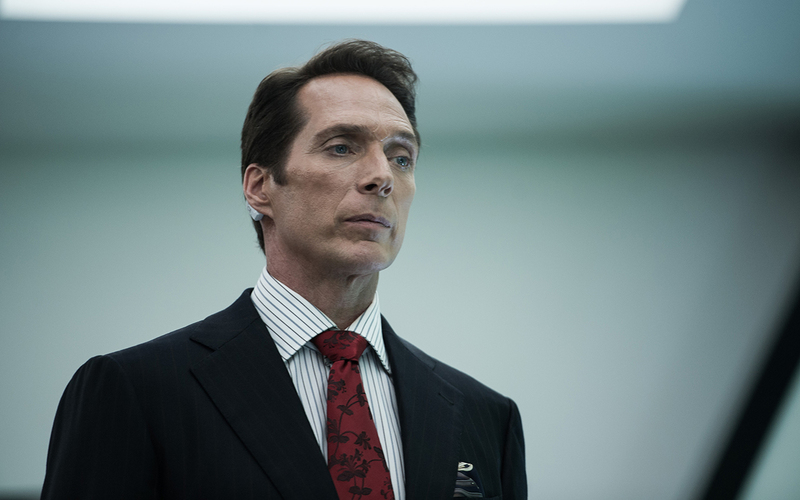 William Fichtner squanders his talent playing John Carlyle, a rich man. That’s it. There really isn’t anything else to say about him. Meanwhile, Jodie Foster hams it up as Secretary Delacourt, in charge of security on Elysium. Delacourt will do anything to protect Elysium from the poor people who want to get there, no matter how many of them she has to kill, because rich people don’t care about anyone else, right? But Elysium wants you to believe that its world is real, a reflection of our world. We’ve seen stratified societies before in science fiction cinema, going back to Metropolis in 1927, but Elysium takes this to a new level by separating the rich from the poor by the vacuum of space. The problem is that its world seems equally vacuous. Elysium, the exclusive space resort for the rich, is how someone might imagine a wealthy gated community if they’d never visited one and never talked to a rich person. Without personally knowing how wealthy people live, the temptation is to believe that they don’t deserve their wealth, that it came to them by magic or by exploitation, and that they don’t know how to use it properly. This is how the population of Elysium is portrayed. We are shown an Elysium where no economic activity appears to take place. There seem to be no businesses on Elysium. The one business we are shown has a factory on Earth but sells its products exclusively to the Elysium government. The people of Elysium want to keep all of their wonderful products and services to themselves (although it is a mystery where they all come from). There is apparently no attempt to expand the market to those living on Earth, with varying levels of cost and quality. All this leads to the following question: how can they afford all these things? This is an anti-capitalist fantasy where we are supposed to believe that rich people are rich just because. There is no impression that this is a world governed by normal free market economics, but we know from real world experience that without free market economics there is no growth to produce the wealth that the people on Elysium appear to enjoy. By enforcing such a closed market, Elysium would not remain wealthy for very long. It’s also quite unclear how Earth and Elysium are governed. There is a president and some kind of council, but we aren’t shown how they are elected and whether the people of Earth have any say in the matter. I think we are meant to assume that the Earthlings, lacking citizenship, do not have a democratic vote. But are we then expected to believe that the tiny population of Elysium could control billions of angry, disenfranchised people on Earth with nothing but security droids and a single delusional South African mercenary? Why quibble about these details? Why complain of stereotypes, caricatures and a shallow world, when the film obviously has a message to preach? These details matter because rounded characters and a realistic world are essential to providing the depth necessary to communicate a deep message. This is a story about inequality and human rights. It has a message to get across, but it’s anyone’s guess what that message is. Being as charitable as I can, I imagine that the message is supposed to be: “entrenched economic inequality and political disenfranchisement is bad”, but that’s about as interesting as a science fiction film that argues space is black. Being less charitable, and taking nothing but a surface reading, the message might be: “rich people are bad, poor people are good”. Without depth to the characters and world, the film lacks the nuance and complexity to contain anything but a basic and simplistic message. The themes of inequality and human rights deserve more than a simplistic message. Intelligent audiences deserve more than a simplistic message. Because a simplistic message on themes as complex and deep as these is barely a message at all.